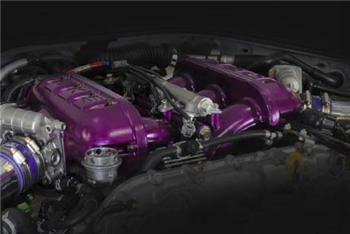 HKS has newly developed Surge Tank Kit with a stand-along tank for R35 GT-R. HKS Surge Tank Kit shows its presence in the engine compartment. This kit was designed to equalize intake air volume of each cylinder so it allows stable engine output. Also, this kit improves the engine compartment appearance. Twin Injector Pro Kit, an additional injector installation delivery pipe, was also designed and released for high performance fuel tuning. To withstand the GT1000 Spec., the port diameter was enlarged, the port shape was changed, and airflow volume was re-maintained. Its unique shape maintains the original performance. For engine response improvement, the tank capacity was optimized. The tank shape was designed to provide optimum engine response and airflow. The funnel shape of the port tank side allows full-use of the airflow from the tank side. Reuse of the stock air temperature sensor Installation hole, adapters, blow-by pipe, connecting pipe, etc makes installation easier. No pipe fabrication for installation and no complex layout operation are required. Installing the Twin Injector Pro Kit with thid High-flow Surge Tank provides fuel line the capability for high performance. To use vairous sizes of the injector for the secondary side, injector is not included in this kit. (Injector hole is on the tank to install the additional injector.) This kit was originally designed to use with a stock injector. Injector hole of the surge tank is covered with an injector bolt; therefore, it can be used with single injector.